Ronit Gajanan More the upcoming cricket star from Belgaum picked up two wickets in his 18 over spell giving 57 runs against Haryana in the Ranji Trophy match being played in Rohtak. He is also part of the Chennai Super kings team and he has also played for Australian Institute of Sport, Belagavi Panthers,Chennai Super Kings, Karnataka,Karnataka State Cricket Association XI, Madras Rubber Factory. 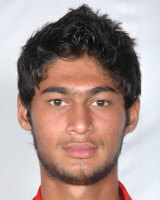 He made is First-class debut against Uttar Pradesh v Karnataka at Meerut, Nov 17-20, 2012. 1.Rani Kittur chennamma- freedom Fighter who defeated the british. 10.Adil Shah- A notable vehicle expedition of World Class. I am able to Recollect only 14,Other personalities may be added to the list .